Merry Christmas Mary and I agree, the tree is perfect! Thank you, Mae. And a warm Merry Christmas to you! Ha! I remove my glasses before looking in a mirror and get the same exact effect! No bags, sags, or wrinkles!! Thanks, LB! 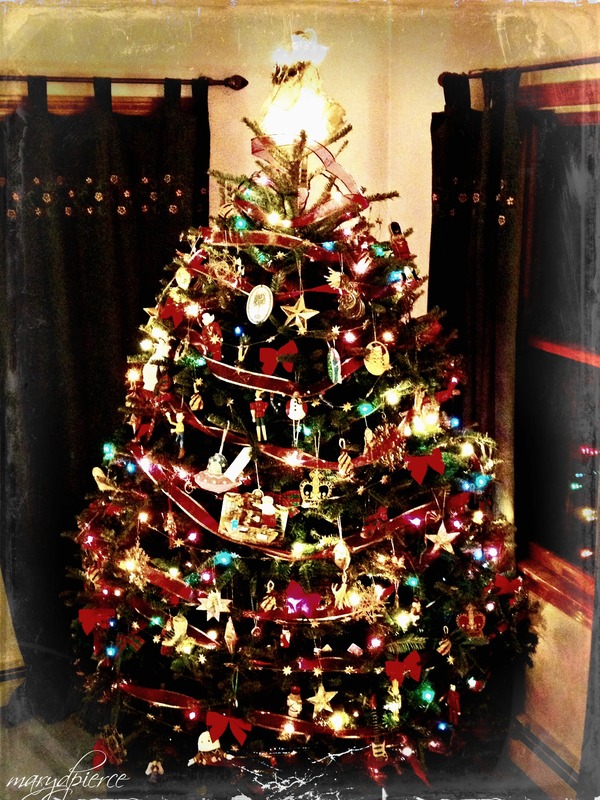 It was indeed a lovely Christmas, starting with my son, my husband, and I “admiring’ the tree right after I got done writing this post. Merry Christmas to you and yours! A lovely post, Dear Mary. And, Yes: a perfect tree. Merry Christmas, Dear Friend–to You, and Bob, and Mr. J. Looking forward to more of your delightful posts in 2014. You are a wonderful friend, for which I am grateful – on Christmas and every day. xox to you and Ray! Thank you, Cathy. And I hope you are getting used to the cold again. Enjoy the rest of the holiday week. Warm wishes for the new year, my friend! Your post is perfect – just like the tree. Thank you, Ronnie. I do hope your Christmas was a lovely as you are. You are a treasure, and I have so enjoyed your friendship. Happy New Year! I couldn’t resist commenting on this, despite my ill health. Such a lovely post, Mary, and as always you have a tender and soothing way of connecting with your readers. The tree really looks beautiful. Here, we love having one around ’cause it signifies growth and good things still to come. Aside from that the lights it does throw out gives a Christmassy feel–I don’t get that with ordinary patterns of light. Merry Christmas, Mary. And a wonderful 2014 to you and your family. I appreciate you did stop by my blog to wish me well. Dear Uzo, I hope you are taking good care of yourself. I appreciate your kind remarks, and you taking the time to convey them. Merry Christmas to you, and I hope that the new year is one of renewed vigor and good health. I love this post. I hope every person/family feels that way about their tree. Thank you, Kitt. It’s really what Christmas is all about, isn’t it?! Happy New Year! Beautifully written. You have captured the essence of the traditional importance to Christmas. Our Christmas seeped of trinkets and what-nots that each told a story. As with your tree, these items represented current activities and people and also things associated with those passed. We love all of our bits and pieces and the crazy but essential traditions that go with this joyous time. Not least of which is the “It’s a bit dry” Christmas cake. It is an absolute given that one of the many attendees at our Christmas celebrations will be responsible and have the privilege, of remarking “It’s a bit dry” when the first slices of cake are handed out. Will not and cannot change a thing. Enjoy your Christmas and Happy New Year. Thank you, Bristlehound, for the comments and sharing your Christmas traditions, and the “It’s a bit dry” cake. A very Happy New Year to you as well. That tree’s branches hold your lives, literally. So beautiful.